A Dangerous Method is crammed with alarm and peril at the outset. A young, dark-featured woman in white is barely contained in a moving carriage in 1904—she is screaming, heaving, sighing—and she is being taken to a clinic just outside Zurich where she will become the patient of Dr Carl Jung. Outside the smart establishment, on what seems a fine day, she is carried inside still writhing like an eel on a cutting board. She turns out to be Sabina Spielrein, and she is played by Keira Knightley, not an actress who has carried me away in the past. Moreover, I have heard some people say—some people in the psychiatric profession—that Knightley rather overdoes things in this film. When we first see her she is as if convulsed. Later on, she will describe a dream, or an experience, in which some beast touched her naked back, and that seems to be the key to Knightley’s physical attitude—arched forward, her jaw jutting, and her entire being desperate to escape something loathsome behind her. So it’s fascinating when Jung decides in their first “talking therapy” session, to sit in exactly that position. Will that arrangement encourage her to speak out, or make her more afraid? Or is there something in this beautiful, anguished young woman that frightens or seduces her would-be rescuer so he can’t show her his face? A Dangerous Method is by David Cronenberg who has already delivered some of the most startling and horrific films about the eruptions of the body, most of which bear on sexuality, outlawry, and madness. This is a quieter more contemplative film than his sci-fi works; indeed, it starts in science fact. Still, the thrashing articulations of Sabina need to be read in the director’s context, just as that Zurich appointment is the first scene in maybe the most audacious love story on screen this year. Not that large audiences are flocking to A Dangerous Method. Christopher Hampton did the screenplay, adapting his own stage play of 2002, The Talking Cure, and using the non-fiction book, A Very Dangerous Method, by John Kerr. It is a film about Sabina, but it is also the story of Jung and Sigmund Freud and of the curious way in which their relationship in the years before the First World War acted out the early development of the cult of psycho-analysis. It’s a very talky film, and you can feel the shape of a stage play behind it, but it’s only gradually that we realize how far Hampton makes the talk as taut and probing as that of today. There are two love stories. The less obvious one is between Freud and Jung, the master and pupil, seemingly, and both of them in a wild spin of emotions over allegiance and authority. They say they admire each other; they talk as colleagues in the battle to persuade the world about analysis. But then notice the scene where Jung goes to Vienna to meet Freud for the first time. We see the two men at the dinner table, and Freud passes the large plate of food—meats and vegetables—to Jung, whereupon the young doctor helps himself to about half the plate-load. At which point, Cronenberg cuts to reveal a dozen other people sitting at the table, the family, watching and waiting for their woeful turn. The shock is not underlined; there is learned talk carrying on over the “accidental” greed or aggression—except that Jung does not really believe in accident or coincidence. It’s there for us to take in, in just the way that Freud later “passes on” one of his patients to Jung—Otto Gross (Vincent Cassel—and excellent), another analyst and a libertine, an enemy of all forms of repression, and the very man to dangle before Jung the inevitability of an analyst sleeping with a patient. That is what prompts the affair with Sabina, which, in due course, allows Freud to adopt a disapproving attitude to the younger man. This therapeutic world is an arena of power-plays where the helpless Sabina is revealed as the most insightful and searching person around. That may make the movie sound like a treatise on analysis. I don’t think that’s so. This is a story of competing affections, a kind of father, son, and invasive woman triangle. It’s not conventional. As the love affair between Jung and Sabina develops, she takes pleasure in having him thrash her, and Cronenberg films those moments as graphically as you might expect. There is a shot of a small yacht (a gift to Jung from his wife) floating on a still lake with Jung and Sabina lying together in its hold like embryos that is vibrant with suggestion. Jung’s wife (Sarah Gadon) is beautiful, sedate, rich and frequently pregnant—she is the ideal bourgeois wife of that moment, and our time, too, but she knows she is a lost cause. She and Jung are Aryan—Sabina is Russian and Jewish. All these strands are gently pulled together by Hampton and Cronenberg in what amounts to a movie about repression and release in the early twentieth century. 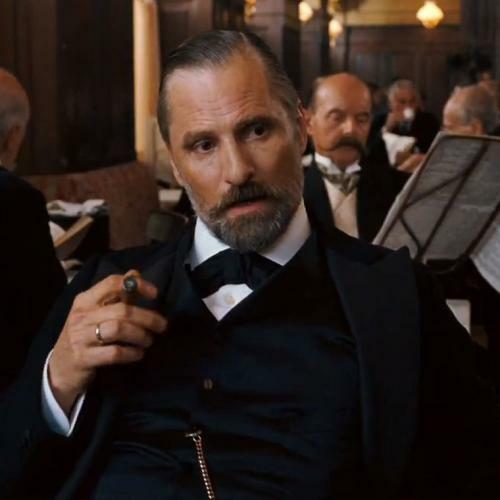 Jung is played by Michael Fassbender and Freud by Viggo Mortenson. In a sense, Fassbender is more exposed: He is the young protagonist, rather immature or complacent, while Mortenson is able to be the skeptical onlooker. This Freud smokes all the time and Mortenson has supplied him with an alphabet of grunts, sniffs, sighs and digestive, puffing sounds that are amazingly eloquent and evidence of a very pompous insecure man. I don’t know how fair that is to history, but it makes for an absorbing drama and leaves the mustiness of cigars in the theatre. We suppose Sabina is cured at the end, though her fierce eyes have not relented. She is married to someone else and pregnant, leaving Jung to regret that it might have been his child, if he’d been brave enough. But he is not quite worthy of her, just as Freud and Jung were bound to split out of familial or atavistic reasons. So it comes as a real addition to the story to learn in the end titles that Sabina went back to Russia and was herself an accomplished analyst before being shot by the Germans in 1942. Which leaves Keira Knightley and my belated realization that she is a formidable actress. I don’t think she goes too far, but repression or unease in an audience are often involved when an actor takes great risks. When her jaw sticks out and her body seethes with feelings she is like an aroused sexual organ, and Jung looks at her from his child’s perspective, shocked but excited, like Jeffrey looking at Dorothy Vallens in David Lynch’s Blue Velvet. Don’t forget the “dangerous” in the title.